Application & Uses of Fullspectrum Lights with Natural Daylight Rendering (Viva-Lite's). There are a number of reasons for switching to Viva-Lite® Full Spectrum Lights: From obvious benefits in colour reproduction, color fidelity and health reasons to cost effective savings and increased sales and customer satisfaction. A high colour reproduction is a most important sales tool for many companies and colour sensitive businesses. Viva-Lite® is a perfect solution as even for objects and materials containing fluorescent substances the colours are reproduced true to nature – say for example in clothes or in dental technology which is the reason why Viva-Lite® is so popular among dentists or in boutiques. Who would want to see that the colour selection of the own fabricated denture after all does not match 100% with the natural teeth? Or have you come across something similar that while liking the colour of a garment in a store (that eventually made your purchase it), when examining it under natural daylight, the actual colour of a pullover or a trouser may appear quite differently? Through a skillful lighting arrangement with Viva-Lite®, presentation of goods can achieve significant turnover growth. The result is, foodstuffs will appear more fresh or paintings shine more (after all, mostly, they would have painted under natural sunlight! ), flowers and plants grow rapidly and are less susceptible to pests, jewellery items appear more expensive and high class, as they glitter and sparkle more than before. If people feel good, a lot of good things can happen. It is a fact that light not only influences our immune system but also our state of mind and general health & wellbeing. One aim of the Viva-Lite® spectrum therefore is to create an ideal ambience in companies, offices and in homes for working & living. After all if the environment is good, we might just enjoy working a little more than usual and automatically become more productive and more creative. With Viva-Lite®, a lack of concentration due to ill-lit rooms can always be counterbalanced: Eyestrain, headaches and fatigue can be kept at bay by minimizing the otherwise adverse effects of light and electro-magnetic pollution. Stress, aggressiveness, hyperactivity and difficulty in learning are not uncommon due to flickering and bad lighting, which triggers off a permanent stress in the humans who then are often diagnosed wrongly. Viva-Lite® aims to lower stress levels, lessen headaches and improve communication and productivity in companies, also by lowering illness rates amongst staff. 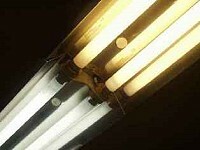 Simply changing the lamps can be an easy solution to many of the above mentioned problems. If you have constant or regular headaches at the working place, why don't you simply try it out for yourself? Most of our resellers offer 4-weeks trial-periods either for free or a nominal fee that enable you to make a risk-free decision and to find out for yourself, how much the light's spectrum is influencing us every day. The initial investment for the acquisition or re-equipment with Viva-Lite® lighting systems may seem rather expensive at first. That is not so, if we consider the long-term benefits such as enhanced productivity and creativity, decreased absenteeism due to illness and errors due to lack of concentration and an improved motivation for the employees - in short a direct influence over "economic efficiency". And then there are the statistics: Viva-Lite® full spectrum lights have an extraordinarily long lifespan while being low on power consumption. If Viva-Lite® full spectrum tubes are used in combination with the so-called electronic ballasts, besides mere savings on power of about 1/3 one can expect even a longer lifespan for the tubes – mostly double the normal lifespan, in other words, onetime less for change of tubes. Studies also indicate that by using lamps with a high colour reproduction / rendering index (Ra / Cri), generally less lamps need to be installed as reading and working falls easier under such lights ultimatively saving cost and energy alike. These are just a few examples where Viva-Lite® at this very moment and in many places around the world increases sales, saves money and energy while improving the overall health and state of mind of people working under artificial lights on a daily basis. We hope you enjoy your visit to the Viva-Lite® homepage so far and are happy about your Comments. "The proportion of students with dental caries lit with full spectrum lamps was lower than the proportion of students with caries in the classroom lit with normal fluorescent lamps." Light it with full spectrum lamps. It saves energy and thus has a positive influence on the climate. Most important however is that it has a positive influence on your mind. You will enjoy the light, under which you see good and where the colours are real and the shadows are natural. Good light influences the future of your children positively in readin and learning. Give them Viva-Lite® as a present. They'll see better instantly. Explain about Viva-Lite® and the importance of the light spectrum to the teachers of your children. The reading speed is faster and your children will get better degrees. Nobody enjoys staying in hospitals for long. Studies indicate that full spectrum lights can reduce the recovery time after surgery. Ask the hospital staff if their rooms are equipped with full spectrum lights.